Three tasty tid-bits today: Dried persimmons, a sweet potato vine, and Sweet Potato Cakes, take 2. The little Korean store on the corner had packages of these beautiful dried persimmons that I could not resist. 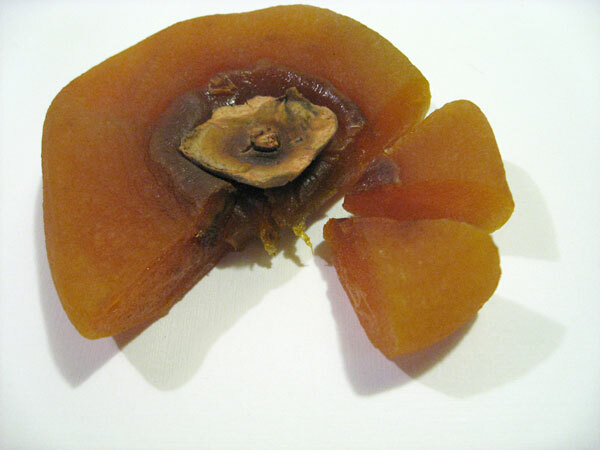 From pictures online, I think these are different from Japanese dried persimmons, which seem to be more wrinkled and coated with natural sugar. Never mind—these a nice to just snack on. They taste a little like dried apricots. 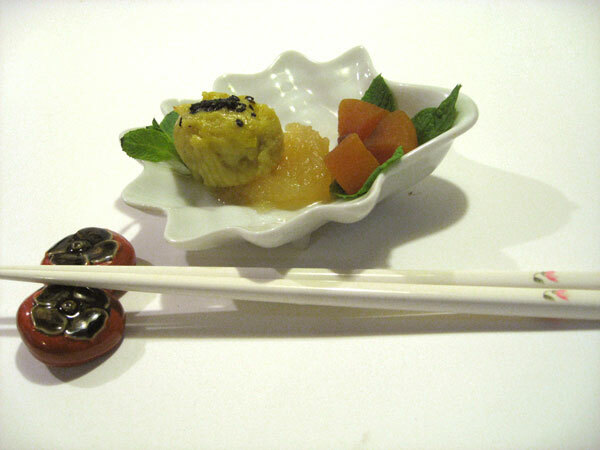 I have a recipe for a salad with persimmons and daikon (kakinamasu) that I plan to make soon. The Koreans apparently make a drink with ginger and dried persimmons. I will have to do some research; if the woman who speaks English is at the store, maybe she could help with a recipe. 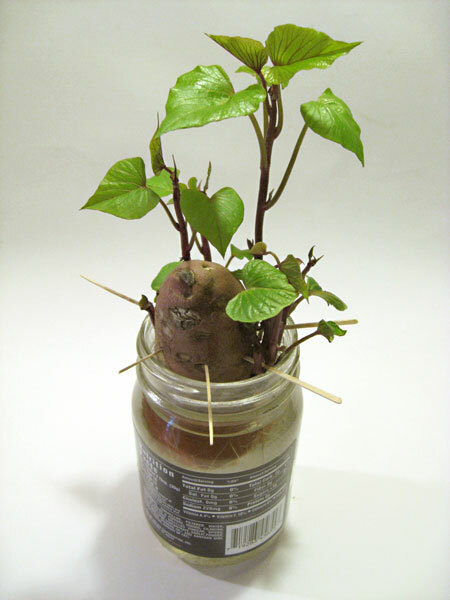 I remember growing vines with sweet potatoes when I was a kid. Sometime along the way, though, the sweet potatoes you’d find in the stores were all treated with something to keep them from sprouting. Not so with the Japanese sweet potatoes! What fun to discover a neglected potato sprouting on the counter. The leaves are very pretty. Peel, core, and cut the apples into thin wedges. In a pot combine apples and water. Bring to a boil, turn the heat to medium-low, and cook, covered for 10 minutes. Add sugar and lemon juice, and cook until the sauce is thick and glossy. 20 minutes? Mash the sweet potato until smooth. Add 2 egg yolks, one at a time, mixing thoroughly after each. Stir in the cream, sugar. and nutmeg. The mixture should be quite thick. The recipe has the cook form the mixture into mini-sweet potato shapes and place them on a cookie sheet. Even with less liquid there was no way for me to do that, so I used mini-cup cake papers to bake the cakes. 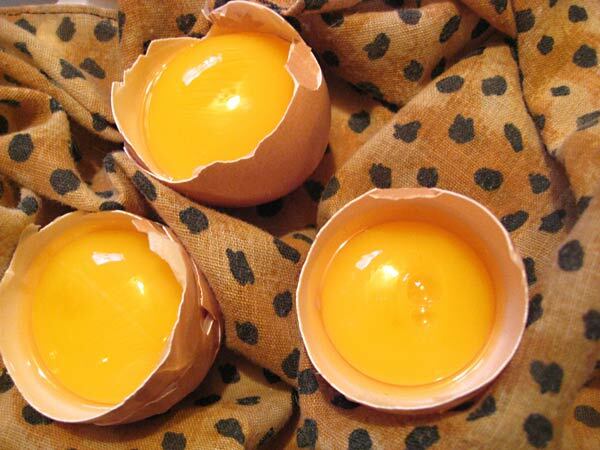 Thin the last egg yolk with water and brush the tops of your cakes with it. 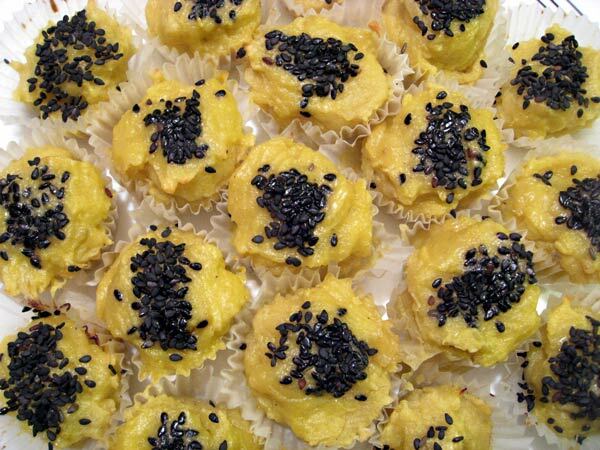 Sprinkle the cakes with sesame seeds. Heat oven to 375°F and bake until the cakes are golden, about 15 to 20 minutes. Serve with the apple jam and garnish with mint leaves. Spire on Gingko Nuts Snack and House!